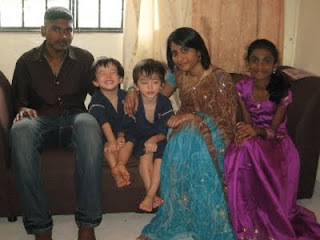 It was Deepavali on Saturday. It marks the triumph of good over evil, the victory of light over dark. Candles are lit and it is also called "Festival of lights". Malaysian Tamil families usually go to the temple for prayers in the morning, and they hold Open House the rest of the day. We were invited Christina's family as well. 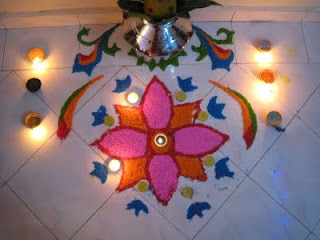 On the floor, there was a beautiful art made with coloured rice grains, with candle lights. All her family members, except for her teenage son!, were dressed up and they served us a very big lunch. Aratakara also greeted them in Malay, "Selamat hari Deepavali!"